Stearns High School freshman guard Alisyn Alley scored 23 points and recorded eight assists and five steals to lead No. 9 Stearns of Millinocket to a 70-45 upset win over top seed Central Aroostook of Mars Hill in their Class C schoolgirl quarterfinal at the Cross Insurance Center Tuesday afternoon. BANGOR, Maine — It took dynamic Stearns High School freshman guard Alisyn Alley just 4 minutes and 43 seconds to reach double figures and stake her team to a sizable lead. She finished with 23 points, eight assists and five steals to lead No. 9 Stearns of Millinocket to a 70-45 win over top seed Central Aroostook of Mars Hill in their Class C schoolgirl quarterfinal at the Cross Insurance Center Tuesday afternoon. Central Aroostook wound up 15-4. She scored 10 of Stearns’ first 14 points as the Minutemen built a 14-2 lead and she finished the first half with 17 points as Stearns took a 34-20 lead into the intermission. Stearns outscored Central Aroostook 9-2 to open the second half and squash all Panther comeback hopes with Alley scoring seven points and looping a pass to Annalys Robinson for the other basket. “I was nervous at first but then I was fine,” said Alley who felt she was capable of putting up good numbers in her Cross Insurance Center debut. Older sister Kat, who finished with 12 points and three assists, wasn’t surprised by her younger sibling’s performance. “She usually does more than that,” chuckled Kat Alley. “We’ve been waiting three years for (Alisyn) to get here. She’s a stud. My only complaint is that she’s too unselfish at times,” said Stearns coach Nick Cullen who considers Kat Alley to be the leader on the court and the steadying influence on the team. The Alley girls are the daughters of Raymond Alley, who scored over 2,000 points at Vinalhaven High School and Bangor’s Husson University, and Kristi Wildman Tapley, a 1,000-point scorer at Husson. Robinson had 19 points nine rebounds and three assists for the winners. Kasey Kenyon contributed four points and 10 rebounds. “We played real well for our first game here,” said Kat Alley. 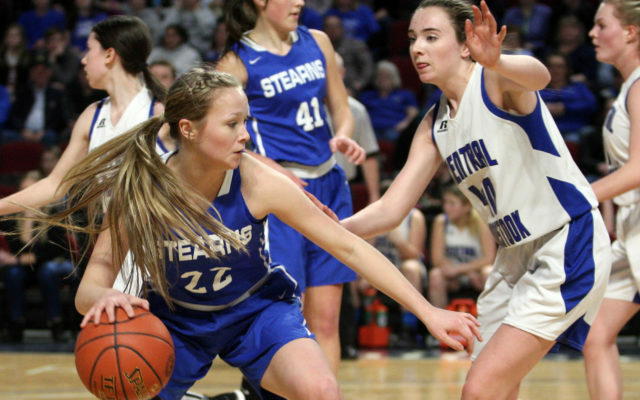 Sydney Garrison and Ashlee Harris had nine points apiece to lead Central Aroostook. Garrison also had three rebounds and two assists. Breann Bradbury had eight points and six rebounds. Kayla Martin produced five points and Annika Nicholas chipped in with four points and nine rebounds.